Busy week, huh? I seem to have temporarily lost my appetite (nothing that Christmas treats at home won’t be able to cure), so I made us some cocktails! 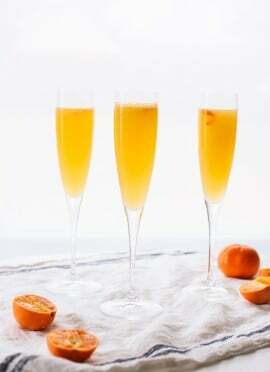 I can attest that these strong, brunch-appropriate cocktails go great with my butternut frittata. 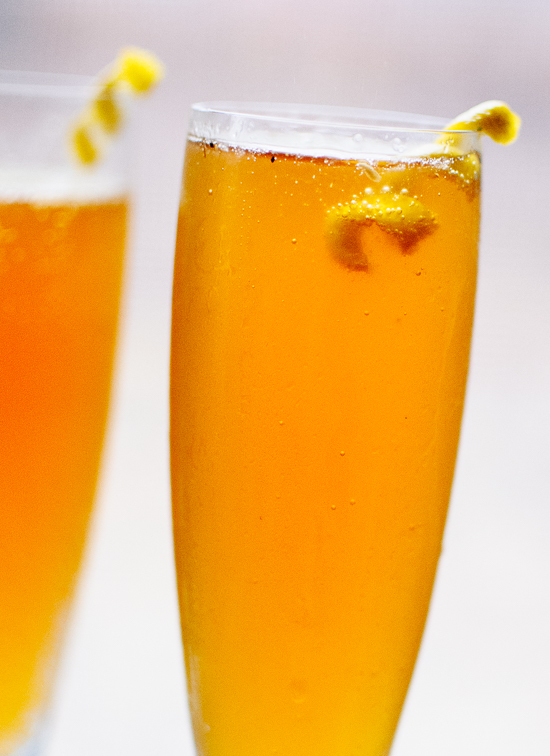 Just remember—you’re adding gin to Champagne, so these pack a punch. Which means they might be just what you need at the holiday table. I tasted this cocktail at Cafe Flora in Seattle a couple of months ago. I was so excited to eat there since Bill had recommended the restaurant to me a couple of years ago. My brother was driving, so I ordered one of these while we waited for our vegetarian brunch to arrive and I marveled at the fiery red trees outside. Needless to say, I was a fan and knew I had to recreate these for the blog. This Earl Grey-infused gin is the easiest infusion I’ve made yet, so please give it a try! It only needs an hour. The rest is super simple—the honey simple syrup comes together in just a couple of minutes on the stove (making simple syrup instead of straight honey helps the honey disperse into the drink). 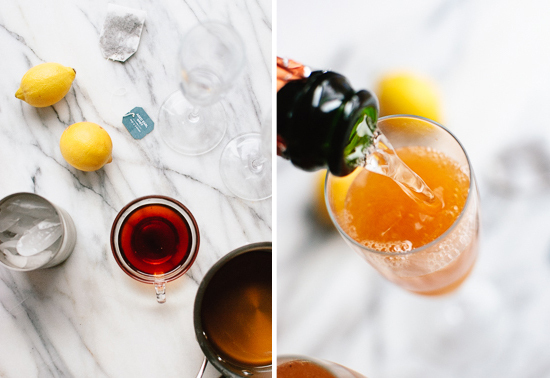 Shake it up, pour it into glasses, top it off with bubbly! Cheers from Cookie and Kate. 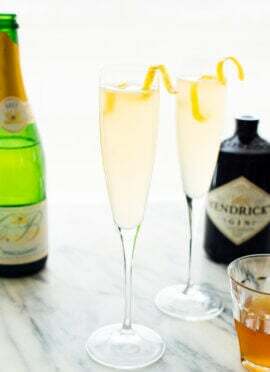 Earl Grey-infused gin makes this French 75 brunch appropriate! 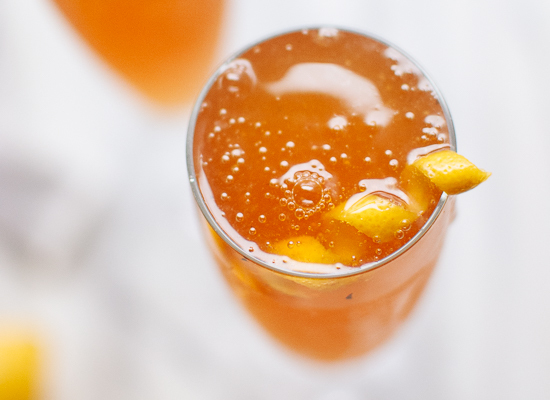 This strong, sparkling, citrusy cocktail would be welcome any time of day, though. Amounts given below for infused gin and simple syrup yield 4 drinks, so scale up as necessary. To make the infused gin: Measure out the gin and submerge tea bags in the liquid. Cover the gin and let it seep for 1 hour. Then remove the tea bags, squeezing absorbed gin into the mixture before discarding the bags. To make the honey simple syrup: Combine the honey and water in a small saucepan. Warm over medium heat, whisking occasionally, just until the honey has melted into the water. Remove from heat. To make a cocktail (you can make multiple drinks at once): Fill a cocktail shaker with ice. Pour in Earl Grey-infused gin, lemon juice and simple syrup in the proportions listed above. Securely fasten the cap on the shaker and shake until well chilled, about 20 seconds. Strain the liquid into Champagne glasses and top with Champagne. Garnish with a twist of lemon. Recipe inspired by Cafe Flora in Seattle. These sound/look delicious!! Happy holidays! Happy Holidays and Prost, this looks like a great drink. 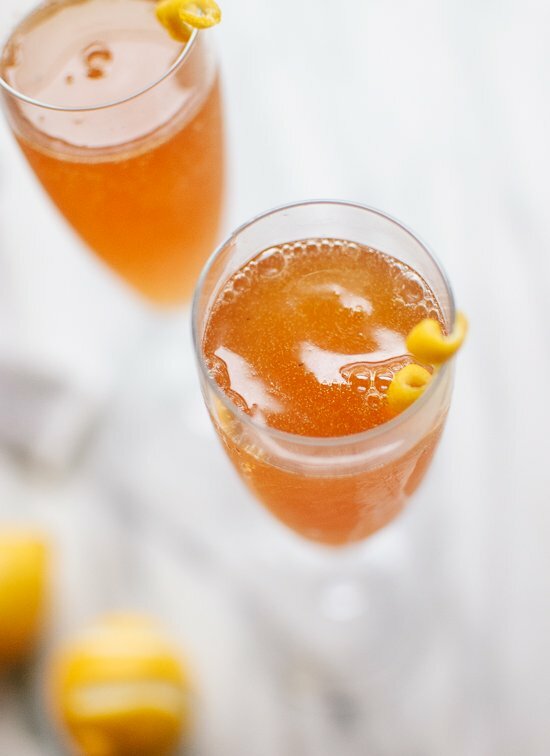 Every holiday calls for bubbles. Let’s see what you come up with for Groundhog Day! Love the tea infused gin. I’m sipping on a hot earl grey right this very second…and now it just seems lackluster by comparison! Beautiful bubbles! How lovely. Earl Grey with booze. This is going to make my wife smile. Thanks for this recipe. Beautiful, simple and unique. Thank you for sharing Kate! I look forward to making this. Love the color, and the use of tea. Makes it healthy, right? Merry Christmas, Kate! I had never heard of this cocktail before, and then right after you posted it I saw it on a wine bar menu. So smart AND gorgeous! Well, what do you know? They are tasty! Can you just live in my house and make me cocktails? Every single one you post here makes me drool. Tea-infused gin! Now that just screams BRUNCH ME. This sounds wonderful! I love any drink involving bubbles :) Ok, and gin :) Happy 2015, Kate! My husband made these for Christmas and New Year’s Eve, they were delicious and a hit with our guests! I have to say that your website has become my go to site for creative, delicious, healthy, and easy to follow recipes. Thank you! You are inspiring! if i don’t have time to infuse gin with earl gray can i make the recipe with gin and then add 30 ml of earl grey tea (hot water with earl gray) ? Are most of your recipes on this blog in your new book? Hi, Lynne! Nope, my new book will include all brand new recipes. A very good recipe I really like this food. How to make it was relatively easy. I like grey french..
Hi Kate! My husband doesn’t care for Hendricks gin. I’m wondering if I could use another gin (Tanqueray?) or if the flavor of the Hendricks is important to the end product. 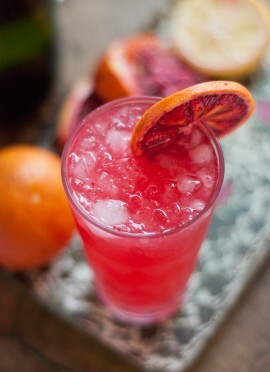 Would love to make this as a party starter this NYE! Hi Kio – Great question! I prefer Hendricks, but you can use a good gin of your choice. Enjoy! This is a fun one for NYE for sure.